Designed to reduce radiation exposure to the eyes, these lead glass goggles are framed with soft, pliable vinyl and held on the head securely by an adjustable strap. Vents top and bottom of goggles to help prevent fogging. 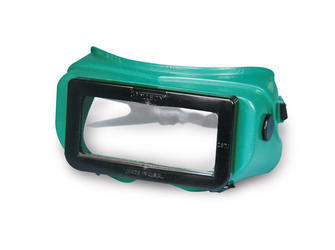 Eye shielding is provided by a 2" x 4.25" single sheet of fluoroscopic quality lead glass. The 4.2 density glass will effectively eliminate more than 95% of direct radiation produced by gamma rays. Glass provides 2.00 mm lead equivalency.